Even though it's called a grain — and it's prepared and served like other whole grains — quinoa is actually a seed from the goosefoot plant. Most people can enjoy quinoa and reap its nutritional benefits without worrying about side effects. Quinoa is not associated with food allergies, but it does contain some ingredients that could cause problems. If you experience a gastrointestinal reaction after eating quinoa, it's probably due to fiber or substances called saponins. Quinoa is one of the few plant-based foods with complete protein, and it's a good source of iron, zinc, folate and vitamin B-6. One cup of cooked quinoa also has 5 grams of fiber, which delivers a good portion of the recommended daily intake of 25 grams for women and 38 grams for men. However, this amount is high enough to cause side effects if you're not used to eating a lot of fiber. If you experience gas, bloating or diarrhea after eating quinoa, fiber may be the culprit. You can limit the problem by starting with smaller portions and adding fiber to your diet gradually. As you boost fiber intake, be sure to drink plenty of water or noncaffeinated beverages. 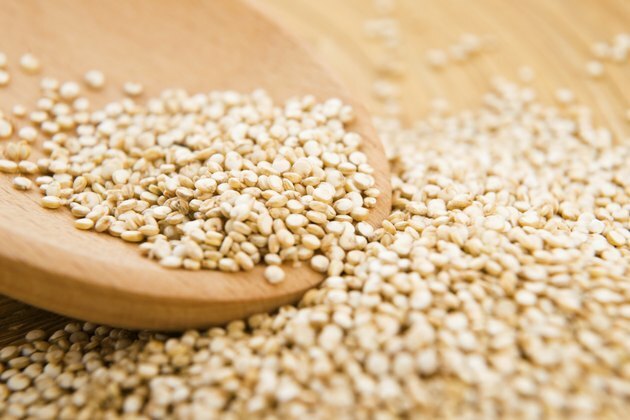 The outer layer of the quinoa seed contains substances called saponins. In some foods, such as beans, saponins are edible phytonutrients that may deliver health benefits. The natural saponins in quinoa repel insects, which is a benefit because the plant doesn't need additional chemical pesticides. However, you should not eat quinoa saponins. They have a bitter taste and may damage the small intestine, according to Purdue University. Many brands of quinoa are prewashed to remove saponins, but it's a good idea to rinse the seeds again prior to cooking to be sure all remnants are removed. If you're not sure whether the seeds were prewashed, rinse them several times in fresh water. Quinoa does not contain gluten, which makes it a good option for anyone diagnosed with celiac disease, wheat allergy or gluten sensitivity. Some types of quinoa contain substances called prolamins, which could trigger an immune response in people with celiac disease, reported the American Journal of Clinical Nutrition in August 2012. However, more studies are needed to verify the effect of prolamins, and most types of quinoa do not contain these substances. Quinoa was well-tolerated by celiac patients when it was included as part of a gluten-free diet, according to a study in the February 2014 issue of the American Journal of Gastroenterology. Many plant-based foods, including quinoa, naturally contain varying amounts of a substance called oxalate or oxalic acid. While nearly all of the oxalic acid you consume is eliminated in urine, it can bind with calcium and may form kidney stones in people who are susceptible to calcium oxalate stones. If you have a previous history of kidney stones, consuming foods higher in oxalic acid, like quinoa, may increase the risk of developing more stones in the future. Talk with your health care provider before eating quinoa if you follow a low-oxalate diet. Is Quinoa a Complete Protein Food?